First of all, I want to thank all of you for having come to this particular teaching. In the Buddhist tradition, when receiving Dharma teachings, our motivation is extremely important. The very pure motivation is Bodhicitta, the wish to achieve enlightenment for the sake of all sentient beings. Bodhicitta enables devotees to enter the great vehicle of Mahayana-Dharma correctly and through practice to achieve the perfect effect, which is enlightenment. So, as we begin, let us arouse the mind or heart of enlightenment. These days there are scholars who doubt that Asanga went to Tushita and received these teachings from Buddha Maitreya. In particular, a scholar named Ganga Tsultrim, who studied at the University of Varanasi and lived in Japan for many years, wrote a text called “The Analytical Interpretation of the Books of Maitreya,” in which he expressed his doubt as to whether or not the meeting between Maitreya and Asanga could ever have taken place in the way that it is described in our tradition. He wrote, “In fact, because it is impossible, Asanga did not go to the heaven of Maitreya to receive these texts. He received them from a human being in the world whose name was Maitreya.” My own opinion is that his analysis is evidence of overweening pride and of his mistaken understanding that it would not be possible through samadhi, through magical emanations, through various exceptional abilities that are achieved by someone who practices meditation assiduously to visit another area that is not accessible to everyone. In fact, talking from the point of view of Dharma, it is not impossible for someone as accomplished as Master Asanga who had achieved the third bhumi (‘a Bodhisattva’s ground of accomplishment’) and who was a master of meditation. It is indeed the case that he went to Tushita, where Buddha Maitreya dwells, stayed there, and received “The Five Texts of Maitreya” that he then wrote down. There is a purpose and necessity for the composition of these five books. The first book by the Regent Maitreya is called “Abhisamayalamkara-Nampradzaparamita” in Sanskrit, “Shes-rab-kyi-pha-rol-tu-phyin-pa’i-män-ngag-gi-bstän-bcös-mngön-par-rtogs-pa’i-rgyün-ses-bya-wa” in Tibetan (“The Ornament for Clear Realisation”). In this book, the grounds and paths are clearly and explicitly spelled out. Maitreya also offered teachings that are contained in the treatise entitled “Theg-pa-chen-po-mdo-sde’i-rgyän-zhes-bya-ba’i-thsig-leur-byäs-pa” in Tibetan (“The Ornament for the Mahayana Sutras”). In this book, he explained the meaning of the vast array of Mahayana Sutras, so it is a rather extensive text. To protect disciples from falling into the extremes of eternalism and nihilism, Maitreya taught “Madhyanata-Bibhamgakarika,” the text we will be looking at during this seminary. Furthermore, Maitreya taught “Dharma-Dharmata-Bhibhamgakarika” (“Distinguishing Dharma & Pure Being”). His last book is “Maha-Anotharatantrashastra” (“The Mahayana Treatise on the Higher Nature”); it is a commentary on the Buddha nature. Four Buddhist traditions flourished in Tibet. They are the Nyingma, Sakya, Gelug, and Kagyü traditions. All four schools consider the first book by Maitreya, “The Ornament for Clear Realisation,” as extremely important, however, followers of the Sakya and Gelug traditions do not consider the other four books by Maitreya as particularly important, and there is a reason for this. Many learned scholars taught that the way to practice meditation is through inferential reasoning. Therefore, Gelugs and Sakyas spend a great deal of time studying the literature, particularly the texts by Nagarjuna. They do not hold the last four texts of Maitreya in highest esteem. In the context of Mantrayana-Vajrayana, they focus their attention on the “Guhyasamajatantra,” which emphasizes the generation stage of meditation practice (bskyed-rim in Tibetan). Of course, they also practice the completion phase (rdzogs-rim), which is the subtle phase of visualization in Tantra. But they practice it by way of indications and not by way of quintessential instructions that are given as an important part of an oral transmission. The other two Buddhist traditions that flourished in Tibet are the Nyingma and Kagyü schools. Followers of these traditions practice the quintessential teachings by receiving the oral instructions and thus they focus their attention on the nature of the mind right away. As mentioned, Lhaje Gampopa said that his Lineage of practice leads back to the presentation of the mind’s way of abiding and therefore it is important to recognize it at the outset. If that is the procedure, then the later four books by Maitreya are extremely important. They indicate quite clearly just what the mind’s way of abiding is. In particular, they indicate the way in which conventional phenomena are nothing other than appearances of the mind. That is the way that they set out mind only as the conventional or relative status of phenomena. In terms of the ultimate nature of the mind, they explain very clearly the mind’s true way of abiding and what its true nature is. For that reason, the Nyingma and Kagyü traditions rely on and proceed by way of the oral and quintessential instructions. That is why the four later books of Maitreya are of tremendous importance. Why, then, do these particular traditions proceed in that manner? It is for the following reason: Whether focused on the Second or Third Dharmachakra, when it comes to practice, it is necessary to rely on the quintessential instructions that indicate very clearly the mind’s mode of abiding, its actual nature. So that knowledge and meditative experiences come together at one point, it is necessary to understand the way in which things appear and the way in which they abide or exist. The four later books of Maitreya are therefore very important, because they teach exactly what is meant when things are said to exist and what is meant when it is said that things do not exist. The Third Dharmachakra is referred to as “the wheel of good discrimination,” which is to say that on the occasion of the final turning of the Wheel of Dharma, the Buddha clearly differentiated just what exists and what does not exist. The teachings that the Buddha presented during the First Turning deal with the Four Noble Truths, so it seems to be the case that internal and external phenomena exist. In the teachings of the Second Turning, which primarily deal with the “Prajnaparamita,” it seems that everything has been turned around and things are said not to exist. At the Third Turning, the Buddha differentiated clearly just what is meant by saying that certain things exist and other things do not exist. That is precisely why it is necessary to differentiate the middle from the extremes, which the Regent Maitreya explained very clearly and openly in his books that can be understood easily and nicely. It is very good to understand the teachings in these books so that our practice of meditation is beneficial and effective. If we find that investigations that we undertake through study and reasoning lead to one conclusion and the experiences that we gain through meditation are different, then it is not a good outcome. What we find in the books of Maitreya is that the conclusions that we draw through analytical investigations and the experiences that we gain through meditation come together very well. What does differentiating mean? If we do not differentiate and just say that all phenomena are emptiness and things like mountains, school yards, resources, and so forth do not exist, then that does not quite fit with our experiences of the things that appear to us. At the same time, we may wonder, “Do things exist in the way that they appear?” The answer is, no. Conventionally or relatively, things exist; ultimately, they do not exist. That brings with it some consequences that are harmful and dangerous. Saying that nothing exists is saying that there is no virtue to be practiced, no ill deeds to be abandoned, no possibility of falling into lower realms of existence, and no way of achieving a more fortunate rebirth. So, it is a dangerous assertion to make and a point of serious error. On the other hand, saying that things truly exist will not serve as an antidote to confusion or enable liberation. What, then, is the relationship between relative and ultimate realities? Is there a relationship, like mixing black and white together? No, there is no contradiction like that. The ultimate is the nature of conventional appearances and conventional realities arise by way in which the ultimate appears. Since that is the case, it is possible to go right down the middle and not to fall into one of the two extremes of either nihilism or eternalism. Should it be impossible to settle this clearly with inferential reasoning, then it would be impossible to abandon our wrong understanding of reality and we could not realise Dharmata (chös-nyid in Tibetan, meaning ‘the innate nature of phenomena and mind, i.e., pure being’). In that case, meditative experiences will not come forth. So, it is extremely important to differentiate clearly the middle way from the two extreme views. If we do not do that, it is not quite good enough. There are people who say that “Differentiating the Middle from the Extremes” is a text of the Cittamatra school (‘the mind only school’); there are others who say that it is not. Is it or is it not? Yes and no. Both are feasible because there are ways in which it is a text of the Cittamatrins and there are ways in which it is not. We can recognize that by the way that the three natures (the imagined, the other-powered, and the thoroughly established, which are important topics of the Cittamatra school) are presented in the text. But, it is a slightly uncomfortable position to compare the Mahayana traditions with one another by proposing that it is a text belonging to the Cittamatra tradition. Although, like the Madhyamikas, they are followers of Mahayana, the Cittamatrins believe that there are real things. So, it is a little inferior to the Madhyamaka (‘middle way school’) because Madhyamikas cut through interpretations altogether. When it comes to the practice, we meditate in terms of the introduction to our mind’s nature. How will that enable us to abandon samsara (‘the conditioned rounds of cyclic existence’ that are marked by suffering and pain)? Since suffering and pain are not only mental but also physical experiences related to the material world, the Cittamatra commentaries of the Buddha’s thoughts are plausible and meaningful. It is very helpful to understand their view, which is won through analytical investigations. In the practice of Mahamudra, though, the view is won by way of pointing-out instructions. In which way is “Differentiating the Middle from the Extremes” not a Cittamatra text? It teaches the Cittamatra view that external phenomena do not exist, but Cittamatrins believe that the internal mind is some sort of existing entity. Did Maitreya teach that the internal mind is a true existent? No. So, from that point of view, this text does not belong to the Cittamatra school. It teaches the Buddha nature, which the Buddha propounded when he turned the Wheel of Dharma a third time. The Buddha nature, which is the union of wisdom and the expanse of reality, is taught in the Mahayana-Madhyamaka-Shentong tradition. In the Mahamudra tradition, a disciple is introduced to the true nature of his/her mind and engages in practices to experience that appearances are mind only and that mind is empty of intrinsic reality. In this treatise, Maitreya presented logical reasons why this is so. In “Differentiating the Middle from the Extremes,” Maitreya taught that all phenomena and the mind are emptiness. What sort of emptiness is this? Is it an emptiness that is like empty space? No. Space is an absence of things, and nothing-ness is not enlightenment. Even if we meditate on space for aeons, empty space will never yield the good qualities of enlightenment. We would become engulfed in a thick blackness and become completely stupid if we did that. Fruition of meditating on the emptiness that is referred to here is achievement of Buddhahood, which is omniscience, i.e., the wisdom of knowing everything. When speaking of the omniscience that is gained by realising emptiness, immediately a notion of some sort of thing comes to mind. But wisdom is not some thing, rather, it is the luminous clarity of knowing as well as the joyful experience of bliss. If enlightenment were nothing-ness, there would be no knowledge, no freedom from suffering, no bliss. Therefore, in the practice of Mahamudra, emptiness is pointed out as spontaneous presence. The treatise, “Differentiating the Middle from the Extremes,” teaches us that conventionally or relatively speaking, all phenomena are merely mind, just mind, mind only. The ultimate is the Buddha nature. What is the Buddha nature? It is not a substantial thing, rather, it is of the nature of emptiness and jnana (the Sanskrit term that was translated into Tibetan as ye-shes and means ‘primordial unmistaken knowing’). The Buddha nature is the union of wisdom and emptiness within which a realised practitioner can know everything. The main part of the treatise consists of five chapters and concluding words. The five chapters are: The Definitive Characteristics, Obstructions, Abandoning the Obstructions, The Phases and Results of Meditation, and A Summary. The first chapter is an explanation of the general nature of all appearances. It is divided into two sections. They are: The Definitive Characteristics of Samsara and The Definitive Characteristics of Nirvana. This section has three divisions. They are: A Description of the Way Phenomena Abide, A Description of the Way Phenomena Appear, and Understanding Samsara. The view taught in Mahayana is that no phenomenon has an independent existence, i.e., the true nature of all appearances is emptiness. Moreover, followers of the great vehicle learn right from the start that every living being has Buddha nature, such that everyone is originally a Buddha. We might have doubts and wonder, “If that is the case, then how is it that everything has become so messed up and living beings are so confused?” There is a clear way of understanding how confusion has come about. It has to do with the way in which appearances dawn to and for us. We have not understood and realised that their nature is emptiness and that they do not truly exist. Dharmadhatu (the Sanskrit term that was translated into Tibetan as chös-kyi-dbyings, meaning ‘the sphere of phenomena, the limitless expanse of all things’) is emptiness. It is not dead emptiness, rather, it is luminous clarity. And because Dharmadhatu is the indivisibility of emptiness and luminous clarity, various appearances dawn to and for us. Cittamatrins think that appearances are mistaken, but it is undeniably the case that phenomena dawn, arise, appear. Nobody can say that phenomena do not arise and appear at all. We are not mistaken about the fact that phenomena appear, but we are mistaken about their mode of existence. We could say that incorrect conceptuality is a basis for all our experiences of appearances. So, if the various mistaken concepts about appearances are based on incorrect conceptuality, then what is it that does not exist? Then it is written: “(Appearances) are not empty and are not not empty.” This means that conventionally or relatively speaking, appearances are real and not false, i.e., it is not the case that we are utterly confused and mistaken, because there is a relationship between cause and effect. We can understand this better by taking the example of a mirage. Both real water and a mirage are empty of genuine reality and do not differ in that respect. But, we can drink real water and wash our hands with it, which is impossible with the water that we perceive when we see a mirage. Relatively speaking, water is true and is not non-existent, however, it is not true and real either. Rather, it does not exist the way it appears but is like a mirage or a reflection in a mirror. Thus it is stated in the Root Text: “Since existent, they (appearances) do not exist; since non-existent, they exist.That is the path of the middle way,” meaning, it is the straightforward way to go. To develop and cultivate a deductive understanding and to attain definitive knowledge of the way things abide ultimately and the way they appear relatively, it is very important to gain an understanding of incorrect conceptuality. It is important to understand the nature of appearances, especially when it comes to practice and meditation. Everybody likes to meditate. Why? Many people wish to be at peace, to feel relaxed and comfortable, but such motivations to practice meditation are somewhat small. Indeed, our mind becomes peaceful and relaxed and we feel comfortable and at ease when we meditate. Does that represent the truth of the Buddhadharma? No. That is not the ultimate and best thought. There is something better, more profound, more reliable than that. By practicing to realise the way in which things abide and separating from confusion, we separate from all hardships and troubles. By coming to understand the way things exist, we abandon conflicting emotions, develop sharp and clear intelligence, and eventually attain omniscience. The source of those attainments is just this understanding of the way in which all appearances and experiences actually are. It is possible to eliminate suffering, obstacles, hardships, and afflictions because they are based on a mistake; they come about due to being confused. If we realise the way in which things truly exist, then we will separate from confusion. We go about it by hearing or receiving the teachings, then by contemplating the meaning of the teachings, and by becoming familiar with what we have understood by meditating what we have understood. That is how we separate from confusion. It comes about by developing and increasing prajna that arises through meditation. Prajna is the Sanskrit term that is shes-rab in Tibetan and means ‘knowledge or superior intelligence.’ It is through prajna that we realise the way things really are. Is there another method to realise the way things really are? No, there is not. In this division of the first section of “Differentiating the Middle from the Extremes,” Maitreya taught that appearances come about as the eight collections of consciousnesses or knowers. Distinguishing eight consciousnesses does not mean isolating each consciousness from the others. For example, we do not separate a conch shell from its characteristics when distinguishing its color and shape, rather, we better understand what a conch shell is by having it described. Like this example, when we speak about the way in which appearances dawn, are apprehended and experienced, then we are speaking about the collection of eight consciousnesses, the eight knowers. Because it is the basis of all seven consciousnesses, the eighth is called “alaya” in Sanskrit, ‘the basis of all knowers.’ With the alaya as the basis, there come to be the five sense consciousnesses (eye, ear, nose, tongue, and body consciousnesses) that perceive forms, sounds, smells, tastes, and tangible objects respectively. The sixth is the mental consciousness, and the seventh consciousness is the afflicted mentality. The activity of the seventh is to make a distinction between self and others, i.e., “others” being all appearances that arise to the first six consciousnesses. It discriminates everything that is perceived as “other” than what is apprehended to be the “self.” In that way, the seventh consciousness is the root of all afflictions. This division has two subdivisions. They are: According to the Three Natures and According to the Development of the Obstructions. The first subdivision, According to the Three Natures, deals with the way in which we come to understand the topic, how to meditate on it, and how to realise it. The explanation about our experience of objects and eight types of consciousnesses is given in terms of what is called “the three natures” that are first identified in the context of the Cittamatra tradition. What are the three natures (rang-bzhin-gsum in Tibetan)? That which is imagined or conceptually imputed, that which is other-powered or dependent, and that which is thoroughly and perfectly established, i.e., the non-mistaken nature. First there is that which appears, which is called “the near-dawning.” It is gzhän-dbang in Tibetan (‘other-powered’) and refers to conditioned phenomena that arise in dependence upon other things. gZhän-dbang is the basis for that which is imagined, kun-brtags in Tibetan. The imagined nature is what we mistakenly take the dependent nature to be and that we fixate on. Many sorts of dependent phenomena arise and appear to us and we label them as being real due to their relationship with the habitual tendencies or latent predispositions that we have created since beginningless time and that are stored in our eighth consciousness, the alaya (‘the mind-basis-of-all’). Dependent appearances therefore occur and are taken to be something other than what they really are. It is like taking a reflection in a mirror to be the object that it merely reflects. In fact, a reflection that is “other-powered” can never be established as being the real thing. The absence of such establishment is what yongs-grub means. It is the ‘thoroughly established’ and perfect Dharmadhatu (‘the sphere of phenomena, the limitless expanse of all things’). What is the benefit of understanding and realising the three natures? By understanding the threefold classification and then by contemplate them, we meditate on them and in that way come to realise the unmistaken nature of all things. The second subdivision, According to the Development of Obscurations, teaches how to understand and realise the non-existence of any true nature. It is called “the effect of moving from fixation to non-fixation” and includes the discussion of the fixations as well as of the mind and mental events. Having overturned the notion that the three natures are true existents, we might find ourselves clinging to non-existence. So it is necessary to understand that our apprehending mind is not established the way we think it is. That is how we become free of the two extremes of nihilism and eternalism, i.e., the extremes of clinging to either non-existence or existence. The discussion of mind and mental events deals with the cause and effects of our obscurations. Afflictions, hardships, and difficulties that are obscurations come about through incorrect conceptuality by means of the eight consciousnesses, which are also called “the eight types of knowers.” Going into details, there are the mind’s various movements, changes, and transformations that take place in the three realms of cyclic existence (the desire, the form, and the formless realms). These three realms are the format of samsara. What then is the mind? What are the mental factors? What is called “the main mind” is that which perceives an entity or objects that are suited to be perceived and apprehended. The mental factors distinguish the features of what has been perceived and apprehended and are involved with judging whether the features of the object that was seen as “other than the self” are good, bad, pleasant, unpleasant, and so forth. That is the general way of distinguishing mind and mental events. Incorrect conceptuality is the root of cyclic existence and must, without a question, be abandoned. As long as we do not recognize the nature of external and internal phenomena, we continue undergoing a great deal of suffering. We might think that there is nothing particularly harmful about the obscurations, but there is. The fact that the afflictions bring on pain, harm, difficulties, and so on is expressed in the very word that describes them, which is klesha(s) in Sanskrit, nyön-mong in Tibetan (‘afflictions, disturbing emotions’). The afflictions cause us to get into so many difficulties in samsara. This process is described in terms of the twelve branches of dependent relationship. We are thinking about the way things actually exist, their actual mode of abiding, saying that they are not established and are emptiness. Nevertheless, there is a difference between an elephant that we see in real life and one that appears to us in a dream. They are the same in terms of not being true existents, in that they are temporary appearances, and in that we apprehend them. Yet, the elephant we see in real life and the one that appears to us in a dream are different in their durability. The one appearing in our dream arises from nowhere and does not have characteristics of birth and death. The one we see in real life had a father and mother and will die. Both appearances of elephants are the same in that they are empty of a true nature, yet they are different when it comes to their course through a lifetime, their steadiness or lack of steadiness. I am bringing this example to show that the basis of dependent arising comes from what we see in life and not from what that appears to us in our dreams. Dream-appearances arise from our predispositions and do not go through the whole course of dependent relationship. Through the force of fixating on a self, the seed is planted within our mind and is given the name “consciousness, knower.” It is the third of the twelve branches of dependent relationship. 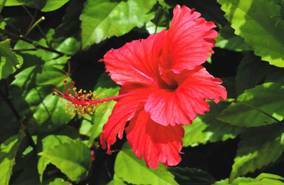 When that seed becomes more settled and steady, then the third branch becomes more durable and leads to the fourth, which is name and form. “Name” refers to feelings, discrimination, all other sorts of mental factors, as well as to the first physical aggregate of the body. The suitability for being born is the fifth of the twelve branches and is called “the sense fields.” The sense fields are the five sense powers of the sense organs and the sixth mental power. They are conditioned to apprehend appearances and to become involved in the world, so the fifth branch is maturation, i.e., having the prerequisites to take birth. The branches of dependent relationship follow one after the other. They are the step-by-step ongoing relationship of cause and effect that is like a seed and its fruit. They do not stop when the six sense mechanisms for apprehending the world are completed. There is continuation into the fifth branch, the six perceptual entrances, which is also called “an increase of awareness.” Their completion leads to the sixth branch, which is contact. When a sense faculty of a sense organ meets with (i.e., contacts) an object, it does not stop there, but the seventh branch arises, which is feeling. Sometimes we have good feelings, sometimes unpleasant feelings, whichever, feelings solidify into some sort of craving, the eighth branch. “Craving” means wanting more or wanting to get away. When craving becomes very forceful, we engage in all kinds of activities to get more of what we want or to get rid of what we do not want. This leads to the ninth branch, called “taking, grasping, involvement” and thus we accumulate karma. The tenth of the twelve branches is called “existence, becoming.” It is the effect of the ninth branch and refers to the establishment of karma as habitual tendencies, latencies, predispositions in our continuum. Because they intensify, there is the eleventh branch, called “birth,” which can be considered from two points of view. From the long perspective, birth refers to taking birth in another life after we have died. From the short perspective, it refers to the way effects of our actions arise during our present life. In any case, after birth come ageing and death, the unavoidable twelfth branch, i.e., once something is born it ages, and due to ageing, it eventually dies. This, then, is the complete process of the twelve branches of samsara that is described in the Sutras as “the great wailing and lamentation of cyclic existence.” It is of the nature of pain, afflictions, suffering. The root or seed of all this is ignorance about the way things actually abide and appear. If we abandon this ignorance and realise the way all things actually are and appear, then the entire process of the twelve branches will fall to pieces and collapse. It will disintegrate, and at that time we will have achieved liberation. The Definitive Characteristics of Liberation. This section has two divisions. They are: A Brief Summary and A Detailed Description. Buddha Maitreya presented a detailed description of the definitive characteristics of liberation that are listed in the verse of the brief summary. They five points are: The Definitive Characteristics of Liberation, The Enumeration of the Name, The Meaning, The Classification, and The Argumentation. As to the definitive characteristics of nirvana, first of all, it is of the nature of emptiness. That is to say, there are appearances of external objects and of internal apprehending minds, however, they are not established and do not exist in the way that they appear to us. The non-existence of external and internal phenomena is true. Because nirvana is devoid of mistaken appearances and apprehensions, it is not polluted and is free from confusion. The explanation of the meaning of nirvana is the third point in the detailed description of the characteristics of nirvana. It was discussed in the second point, the enumeration of the name. The Sixteen Classifications are an extensive description of the emptinesses that are practices of Bodhisattvas. In this treatise, “Differentiating the Middle from the Extremes,” the Regent Maitreya explained the sixteen emptinesses as they are set forth in the “Prajnaparamitasutras” (“The Sutras on Transcendent Knowledge”). Dharmata (‘the innate nature of phenomena and mind, i.e., emptiness itself’) is free of any division and classification. However, there is the discussion of the sixteen emptinesses from the point of view of phenomena. They are the bases for appearances of the different ways in which emptiness is understood. There are three sections of this point. They are: Identifying Emptiness, Reasons for Meditating on Emptiness, and The Emptinesses That Pervade All Others. The first section is a list of the first seven emptinesses that indentify emptiness and describe its nature. They are: (1) internal emptiness is the emptiness of the six internal sense fields; (2) external emptiness is the emptiness of the six objects that are fit to be perceived and apprehended; (3) internal-external emptiness refers to the subtle physical faculties of each sense organ that is in-between the afore-mentioned sense fields and respective objects of perception; (4) great emptiness is emptiness of the world that is the vessel; (5) emptiness of emptiness is the lack of establishment or true existence of any fixations or concepts of emptiness; (6) emptiness of the ultimate is the supreme non-deceptive genuine reality that is known and realised as lacking true existence; and (7) emptiness of all composite things is literally the emptiness of all conditioned phenomena. The second section is the list of eight emptinesses that explain the reasons for meditating on emptiness. The eighth is (8) emptiness of the non-composite. It refers to the fruition from having practiced the paths. The paths are conditioned, but the result of practice, which is attainment of nirvana, is not a state of conditionality. The purpose of identifying the emptiness of the paths in the seventh number and the emptiness of the result in the eighth is to eliminate attachment to both the paths of practice and the result. As long as we are attached to the paths and fruition, we will not be able to give birth to the good qualities that arise while practicing the paths correctly and that are completed when fruition has been attained. (9) The emptiness of that which is beyond limits is the second emptiness that is identified in this set and that is meditated on in order to benefit all sentient beings. It is also translated as “that which is beyond all extremes,” This refers to the extremes of samsara and nirvana. As long as we are attached to samsara, we will fall into that extreme. As long as we are attached to nirvana, we will fall into the extreme of striving to rest in a solitary and peaceful state. By understanding that samsara and nirvana are empty, we will not fall into either extreme. We meditate on the emptiness of that which transcends the extremes in order to be able to benefit all sentient beings. (10) Emptiness of that which has no beginning and no end is the third in this set of eight. It refers to samsara, which is beginningless and endless. What is the reason for meditating on this emptiness? Conventionally speaking, samsara is faulty and that is true. However, from the ultimate point of view, seeing samsara as faulty causes us to want to escape. A Bodhisattva wants to stay in samsara so that he/she can help others. It is not necessary to see samsara as faulty and a Bodhisattva doesn’t when he/she realizes emptiness. This is what enables a Bodhisattva to dwell in samsara and thereby to accomplish the benefit of sentient beings. Therefore, by mediating on the genuine nature of samsara, a Bodhisattva passes beyond abandoning it but, to benefit others, remains in cyclic existence. (11) The emptiness that is called “not discarding” is the fourth in this set. What does it mean and what is the purpose of meditating on it? The purpose of meditating on the 10 th emptiness and on the 11 th is to be able to help sentient beings become free of obstacles. By meditating the 10 th, a Bodhisattva does not aspire to escape from samsara and is not afraid to remain in it. Another obstacle that would prevent him/her from helping others is being attached to nirvana by seeing it as supreme, excellent, sacred. Thus, the 11 th emptiness refers to recognizing that nirvana is empty. “Not discarding” is a description of nirvana and means not discarding samsara by being attached to and aspiring to dwell in the solitude of nirvana. In this set, (12) is the emptiness of the nature. Here, “nature” refers to the potential of enlightenment that exists as Buddha nature within all living beings. If we take the Buddha nature to be an entity, it could not serve as a cause for enlightenment and could not become manifest. We meditate on the emptiness of the Buddha nature so that it manifests. (13) & (14) Since emptiness of that which has its own characteristics and emptiness of all Dharmas are both related to Buddhahood and are meditated on as antidotes for attachment to a Buddha’s good qualities of body, speech, and mind, I will discuss them together. Emptiness of that which has its own characteristics refers to the nature of a Buddha’s extraordinary physical qualities, such as his 32 excellent and 80 complementary marks. “All Dharmas” in the description refers to a Buddha’s extraordinary qualities of mind, such as the 18 qualities, ten powers, four fearlessnesses, and so forth. The second section of the sixteen emptinesses is called “the emptiness that pervades all others.” It consists of (15) and (16). The fifteenth is emptiness of the non-existence of things and refers to no self of an individual and no self of phenomena. The sixteenth is the emptiness of the essence of the non-existence of things and is related to the 15 th. It is the emptiness of the non-existence of the two selflessnesses. We might think that the no self of an individual and the no self of phenomena are true existents or that their non-existence is an actuality. Therefore we meditate on this final emptiness, to realise that the non-existent nature of the two selflessnesses is also emptiness. The fifth point in the detailed description of the characteristics of liberation is the argumentation. Relatively speaking, there are two types of emptinesses, the stained and the unstained. There are ways in which emptiness appears to persons who are on different stages of the paths to liberation. Therefore, it is helpful to speak about an emptiness or suchness that is stained by defilements. If our perception of the genuine nature were always pure, accurate, and clear, then everyone would be enlightened. If there were no stained emptiness, then no matter how much we practice the path, we would not be able to separate from our afflictions and confusion. Thus, although emptiness itself is neither stained nor unstained, in the context of explaining the feasibility of practicing the paths and of achieving fruition, it is spoken of in those terms. These teachings were presented in Tibetan & were simultaneously translated into English by Jules Levinson. They were transcribed from the recordings that Clark Johnson from Colorado had sent by Gaby Hollmann in 1996 & in 2013 the manuscript was revised & edited again so that it is available through the Dharma Download Project of Karma Lekshey Ling Shedra, Nepal. 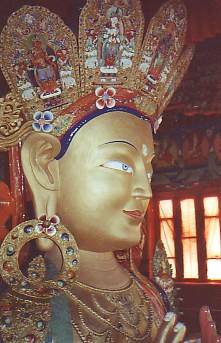 / The photo of Buddha Maitreya at Thiksey Gompa outside Leh in Ladakh was taken by g.h. / This text is for personal studies only; it may not be downloaded & posted or published anywhere else & it may not be translated into another language to be published or posted in that way. All rights reserved. Copyright, Munich 2013. – May virtue increase!